When baseball historians think about a flame-throwing, fiercely competitive pitcher, they do not picture anyone from the modern era. In their mind’s eye, they see Robert Moses “Lefty” Grove. Although largely forgotten by contemporary fans, for those who know best, Lefty is the embodiment of the one pitcher whom nobody wanted to face. “Groves” (as his name was originally spelled) was born as the seventh of eight children on March 6, 1900 in the coal-mining town of Lonaconing, Maryland, situated in the western panhandle of that state. Like many boys from that background, young Bob grew up playing baseball as the primary release from his, otherwise, hard-scrabble existence. He also matured with an attitude that said, “Don’t mess with me.” By the time he reached adulthood, no one did. Robert came from good stock. Both parents traced their lineage back to ancestors who fought in the Revolutionary War. Bob’s father worked in the mines for fifty-four years, but, miraculously, lived in good health until age ninety-two. At age eighteen, Robert himself survived the worldwide influenza pandemic, but his hair began to prematurely turn gray as a result. He also survived a host of physically punishing jobs, including a short spell down in those mines. It is believed that his early work experiences motivated Grove to pitch with savage intensity to escape a life in the darkness and coal dust. By age nineteen, Robert Grove had grown into six-foot-three-inch athletic demon who could throw a baseball like a bolt of lightning. He was very slender, but notoriously powerful, nonetheless. After pitching for local teams for a few years, Grove turned pro in 1920, performing briefly for Martinsburg, West Virginia. His talent was so unmistakable that the International League Baltimore Orioles soon signed him to a contract. They were just ahead of a host of hungry Major League clubs. Although not a Big League franchise at that time, the Orioles were one of the premier baseball clubs in the nation. As of 1920, they were owned and managed by former Major League pitcher/infielder Jack Dunn who had discovered Babe Ruth six years earlier. Both native-born Marylanders, Lefty Grove and The Babe were destined to become, arguably, the greatest man-to-man rivals in baseball history. At age twenty, Lefty Grove could throw his fastball roughly as fast as his boyhood idol, Walter Johnson of the Washington Senators. Although we don’t have scientifically established speeds from that era, it is likely that those two old-timers were among the few fastest-throwing starting pitchers in the history of the game. However, just like Johnson, Grove had trouble with control early in his career. Yet, he was still able to win 111 games between 1920 and 1924. Lefty steadily overcame his control issues, and became the most overpowering pitcher in the Minor Leagues. He stayed in the Minors for five seasons because Dunn and Connie Mack had forged an agreement about his future. Mack was the legendary owner/manager of the vastly successful Athletics, but he was never a wealthy man. He was severely handicapped by the so-called Blue Laws in Pennsylvania which prohibited his team from playing on Sundays. That meant an approximate loss of 40% of his revenues each season. Connie would routinely build championship caliber teams, but then sell his key players once they became established starts. As of the early 1920s, Mack and his A’s were in another rebuilding cycle. Accordingly, Jack and Connie informally agreed that Lefty Grove would continue to pitch for Baltimore until the Athletics were ready to contend with the lordly New York Yankees. As of 1925, Mack was developing future superstars Al Simmons, Mickey Cochrane, and Jimmie Foxx on the Athletics’ roster. That’s when he finally called on Lefty Grove to join him. In that first season together, Philadelphia was pretty good (88 & 64, 2nd place), but their new left-handed pitcher was only so-so (10 & 12). For some reason, Grove relapsed briefly into wildness, and led the American League by issuing 131 bases-on-balls. However, the problem was permanently corrected by 1927, and Lefty never struggled with his command thereafter. That year he finished with a 20 & 13 record while the Athletics challenged the legendary ’27 Yanks (aka Murderer’s Row) by finishing with a strong 93 & 61 second place finish. Both the man and the team were close to greatness. Even then, Lefty Grove was feared by the batters he faced. From that very first Big League season in 1925, he led the Majors in strikeouts, and did so through the 1931 campaign. He rarely threw breaking balls at that stage of his career. He didn’t have to. His fastball was virtually unhittable. Grove threw his “heater” in two different ways. Sometimes, it appeared to actually rise through the strike zone. Just as often, it sunk as it neared the plate, apparently as a forerunner to the modern “split-fingered fastball.” Back then, they hadn’t yet applied that specific name to that particular pitch. Just as importantly, Lefty’s demeanor on the mound was literally terrifying. Grove actually cultivated his image of wildness and reckless disregard for the safety of opposing hitters. In truth, Lefty never hit more than six batters in a season, but, to those who faced him, it seemed like their lives were always in the balance. Grove liked it that way. There is a counterpoint, however, to all these entertaining references to Grove’s combative nature. Lefty was a decent and honorable man. It is said that his boyhood buddies remained his friends throughout his entire life. To them, he was just “Bobby,” that tough but likeable kid from the coal region. It was only on the baseball diamond that Bobby became a beast. By 1929, Grove had been a twenty-game winner for three consecutive years, and his Philadelphia Athletics had dethroned the Yankees as baseball’s greatest team. In fact, the A’s won three straight American League pennants along with consecutive World Series (1929 & 1930). They lost a bitterly fought seven game Series to the St. Louis Cardinals in 1931, but that was not the fault of Lefty Grove. He pitched so magnificently throughout the entire campaign that his performance is sometimes regarded by historians as the greatest single season by a pitcher in MLB history. Grove accrued the mind-numbing record of 31 wins and 4 losses, while leading the league in E.R.A. (2.06), complete games (27), and strikeouts (175). Along the way, he even managed to record five saves. Lefty was so transcendent that he won sixteen consecutive games during one stretch. It was also at this time that the Lefty Grove/Babe Ruth epic rivalry reached its apex. Ruth and Walter Johnson had also competed dramatically, but the Big Train had retired after the 1927 season. More to this point, Johnson was a classic gentleman. Although a tremendous competitor in his own right, Walter seemed to like everyone. He treated Babe Ruth with warmth and respect. That was simply not the way that Lefty Grove did business. Grove once acknowledged that if a teammate hit a hard ball through the middle when he was pitching batting practice, he (Grove) would deliberately hit him with the next pitch (usually in the back). He was that ornery. So, when Grove came into the American League in 1925, he had already made up his mind to never give an inch to baseball’s reigning monarch. In fact, when the two future rivals first met during a late-season exhibition game back on October 1, 1923 in Baltimore, Grove struck out Ruth. Two days later at the Polo Grounds, Grove struck him out again, and added further insult by plugging The Babe with a pitched ball. Ruth was not pleased, but Lefty didn’t care. He gave deference to no one, not even the game’s most popular player. When they eventually faced each other for the first time in an official Big League game, Babe collected two singles, thereby slightly bettering the rookie upstart. Yet, in that same outing, Grove struck out Ruth once more, thereby initiating a back-and-forth rivalry that would last for ten years. It was always primal force against brute strength. Each took turns vanquishing the other until neither could ultimately claim mastery. Our National Pastime never shined brighter than when those two giants collided. At Yankee Stadium on September 11, 1928, Lefty Grove took the mound with a fourteen game winning streak. Grove led most of the way, but weakened in the 8th inning. Facing The Babe with a man on base in a tie game, Lefty unleashed one of his blistering fastballs. As always, Ruth swung from his heels. Bat met ball with a resounding crack. The battered sphere then sped like a rocket until it crashed violently into the 40th row of the right centerfield bleachers. The Yanks won the game, Grove’s streak was over, and the Yanks soon clinched the pennant. Three years later, it was Lefty’s turn to outshine The Bambino. On May 25, 1931 at Shibe Park, Ruth went 0 for 5 in the first game of an important double-header. Most galling for Babe, Grove struck him out in both the 7th and 9th innings, thereby insuring his team’s defeat. Ruth had to watch the A’s pull away on the road to their third straight American League triumph. When it was all over and Babe and Lefty had faced each other for the last time, the final statistics were intriguing. In 135 official at-bats versus Lefty Grove, Babe Ruth had struck out the rather embarrassing total of forty-two times. Contrarily, Ruth had batted a highly respectable .311 and slugged at the productive rate of .526. He had also launched nine home runs. All in all, after all the fanfare and adrenaline, it had been a draw. If I could travel through time to watch only one head-to-head matchup in baseball history, this would be the one. Sadly, Connie Mack ran out of money again soon after his 1929-1931 dynasty declined. Although Lefty Grove was still fantastic in 1932 and 1933, winning 25 and 24 games respectively, Mack essentially sold Grove to the wealthier Boston Red Sox prior to the 1934 season. It should have been a wondrous deal for the Sox, but bad karma intervened. Lefty developed a sore arm, and posted a disappointing 8 and 8 record, along with a dismal 6.50 E.R.A. That’s when the Hot Springs connection happened. 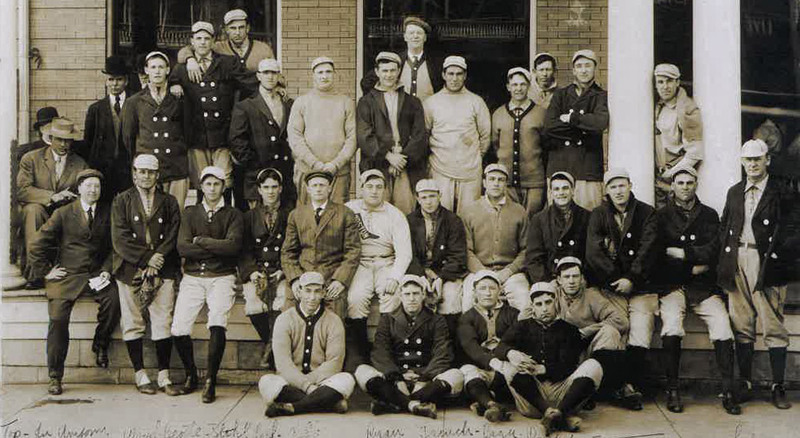 Grove spent three weeks in Hot Springs, Arkansas, before spring training. Every day he had breakfast at 10 and played thirty-six holes of golf, carrying his bag. If it rained, he used the rowing machine. The visit worked. Grove roared back to life with an impressive 20 & 12 record and an excellent (for the 1930s) 2.70 E.R.A. Lefty Grove had found magic in the Ouachita Mountains. Grove performed well again in 1936 and 1937, winning seventeen games in both seasons. In the process, he logged over 515 innings. That was great stuff for a thirty-seven year old hurler. By then, Lefty could still throw a mean fastball, but he had evolved into more of a craftsman. He now often threw a sharp-breaking curveball along with a change-up and forkball (aka screwball). All seemed well in the life of the aging veteran. Then adversity struck again. Although starting effectively in 1938, Grove suffered a “dead arm” in mid-season. Was his extraordinary career at an end? What to do? Before the next season, Lefty Grove simply returned to Hot Springs along with a few of his teammates. The Boston Globe featured a photo of him sitting in a thermal bath in its February 10 edition. On February 21, the Globe reported that the group was doing well, training every day from 9 A.M. to 3 P.M. for the past two weeks. Their regimen included workouts, golf, and the full course of hot baths. Was Lefty Grove able to recapture the old magic in the Valley of the Vapors? Yes. At the age of thirty-nine, Grove turned in an absolutely stellar season. His record of 15 & 4 speaks for itself, and he also turned in a superlative league-leading E .R.A. of 2.54. Lefty credited much of his 1939 success to his pre-season work at Hot Springs, and returned to the Valley in February 1940. During that visit, Grove provided posterity with a powerful example of that classic interaction of hot baths and cardiovascular training. On one of his golf outings, Lefty sped through all eighteen holes in a mere eighty minutes, power-walking all the way. Yet, no athlete can go on forever, and, by 1940, Lefty’s fastball was mostly a memory. At age forty, he was getting by on guile and guts. He started just one game a week, but still managed to post a winning 7 & 6 record. He played long enough to achieve his cherished goal of winning 300 games. That occurred on July 25, 1941. He finished with a 7 & 7 record that year, and retired at the end of the season. Lefty Grove’s career Earned-Run-Average was 3.06. Although there are some pitchers who finished with lower numbers, almost all of them performed in the Dead Ball Era. Lefty did most of his work in the 1930s which is a decade long-recognized for its elevated offense. When we adjust Grove’s E.R.A. for the time in which he played, he is tied for the third lowest among all starting pitchers. Essentially, he and Walter Johnson (recognized as baseball’s greatest right-handed pitcher) finished even. Not surprisingly, Lefty Grove mellowed with age. He would never be regarded as soft-spoken or passive, but, after he stopped competing, he was able to relax and enjoy his accomplishments. He died peacefully at his daughter’s home in Ohio on May 22, 1975. Grove came home to Lonaconing for his funeral as the entire baseball community mourned his passing. A true American legend was gone. As far as we know, Lefty Grove visited Hot Springs on three occasions, but those three trips to the Valley tell us much. When he needed help the most, Grove came to Central Arkansas. Each time, he left the Valley in significantly better condition than when he had arrived. In 1935 and 1939, Grove feared that his Big League career was in jeopardy. He had heard about the success of other pitchers who had trained in the Spa City, and decided to try his luck. Of course, there were other factors involved in Grove’s twin recoveries (most notably, Lefty’s own hard work), but isn’t it fascinating to wonder if Grove would have reached that 300 win plateau if he hadn’t come to Hot Springs? Regardless of the answer to that proposition, Lefty Grove left a big imprint on the history and mystique of Hot Springs. The town’s Historical Baseball Trail wouldn’t be complete without a plaque in his honor. Although he might have had a few flaws, Lefty was a good man. He was also, according to the consensus view of baseball historians, the greatest left-handed pitcher in the history of the game. If we were to compare Lefty Grove to a current player, it would likely be Clayton Kershaw of the Los Angeles Dodgers. Both men stood or stand about six-foot-three (or four) and were regarded as the dominant left-handed pitchers of their eras. There are other similarities, but there is also one dramatic difference: pitch-counts. Despite being recognized as a marvel of endurance and tenacity, Clayton has never thrown more than 132 pitches in a Major League game. It’s true that official pitch counts weren’t kept when Grove was an active player, but modern computer analysis has provided us with formulas for accurately estimating the pitch–counts for every Big League game which is accompanied by an inclusive box score. Accordingly, we know, within five pitches (more or less), the number of pitches thrown by Lefty Grove in every one of his MLB outings. It is an astonishing set of numbers to contemplate. It started immediately upon his arrival in the Majors. On May 18, 1925 in Chicago and twelve days later in Philadelphia, Grove threw 160 and 165 pitches respectively. By today’s standards, that sounds crazy. But just wait. On the Fourth of July at Yankee Stadium just a month later, Lefty hurled 14.2 innings before losing a 1-0 heartbreaker to the Yanks’ Herb Pennock. The estimated pitch-count on that occasion was an incredible 224! Here’s the ultimate attention grabber: while winning a seventeen inning marathon in Cleveland on August 14, 1929, Lefty threw approximately 262 pitches. If that happened in 2018, it would seem as unlikely as a pitcher using eight arms like an octopus. It absolutely could not happen. Please don’t be fooled into thinking that this was an early career phenomenon. After rehabbing in Hot Springs in 1935, Lefty performed as if he had never suffered a sore arm. On July 27 of that year, he took the mound at Shibe Park against his former mates, and stayed there until losing with two outs in the fifteenth inning. That pitch-count amounted to 251. As late as September 10, 1940, at age forty, Lefty Grove pitched a thirteen-inning, complete game victory in Detroit. In order to do that, he threw the ball about 214 times. These numbers stretch the limits of credibility, but they are real, nonetheless. The man was a ferocious combatant.